Hello lovely readers! I hope all your weeks are going great so far! So last Thursday I treated my best friends to a trip to the theatre as all their birthdays are around November. I picked The Woman In Black as I wanted to take them to see something a bit different instead of the usual musical (not that there is anything wrong with a musical). For those of you who don't know The Woman In Black is a novel by Susan Hill. The plot follows a solicitor Arthur Kipps retelling the story of when he was younger and sent to a strange house in the English countryside to attend the funeral of a former client of his firm. Strange things begin to happen when he notices the strange way the locals act when the house is mentioned and when Kipps spots The Woman In Black. I won't go into the plot further in case anyone wants to see/read it. I purposefully avoided looking up the plot as I had never read the book or watched the film (that came out after the stage production). I wanted to go in with a fresh mind and no expectations, the only thing I knew was that it was a horror. So we headed to the Marlowe Theatre in the pouring rain (very perfect given the situation) excitedly. We were sat right at the back but the view was incredible, there was nothing we couldn't see. So did I like the show? Oh my lord yes! It is one of the best things I have seen on stage and now I really want to go back. The cast consists of two actors David Action and Matthew Spencer and they were so incredibly talented. 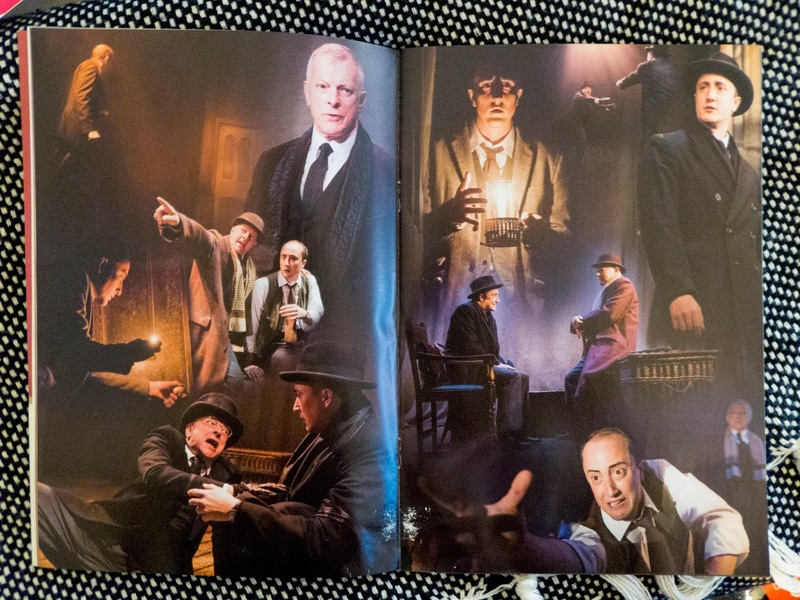 Both actors play all the roles which must be a daunting task but they do it so well that I often found myself forgetting that it was just the same two men on stage. The set is simplistically beautiful with the same props on stage the entire time and just the backdrop changing. This is important as the play is a play within itself, therefore the actors are relying on sound and their audience's imaginations. So was it scary? Hell yes! There were so many moments that made me jump but the tension was so intense it was almost a relief when there was a jump scare. I really admired them for being able to build such an awesome atmosphere without relying heavily on jump scare moments. I held on to Dan's hand very tightly throughout the show that I'm surprised that he didn't lose all feeling in it. I love ghost stories and (like they say in the play) I think they are perfect for this time of year when it's dark and cold and Christmas is approaching. I would recommend The Woman In Black to anyone who likes being scared but really entertained at the same time. But if you do go to see the show maybe sleep with the lights on! I hope you enjoyed this post, have you seen The Woman In Black? Do you like ghost stories? 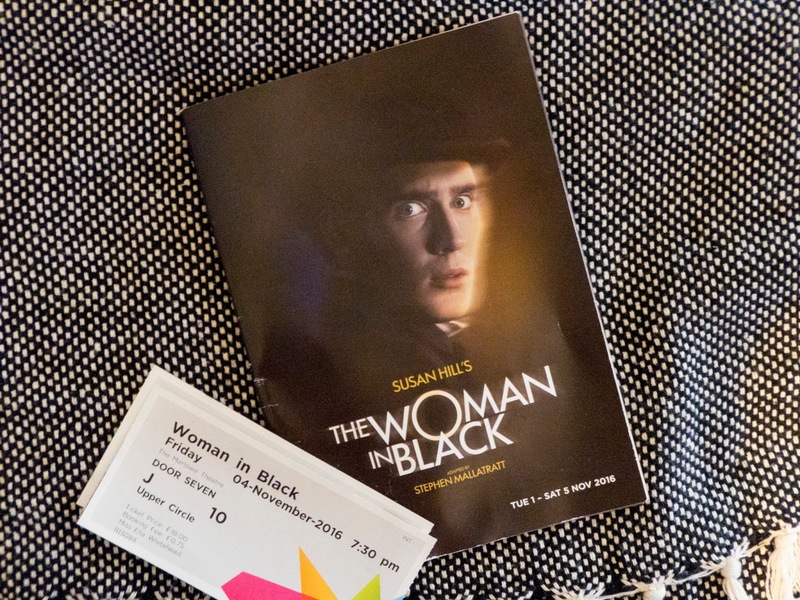 I saw The Woman In Black a few years ago on the stage (I was spoiler free too) and oh my lord I jumped and at one point I even screamed (I am a wuss). When I jumped I made on accident the people next to me jump. It was amazing and a fab two man show! I really want to see it again. I think it's often better to go in free of expectations! Haha don't worry I jumped a lot too. Thanks for popping in! I definitely recommend it, it's amazing! Thanks for stopping by lovely!